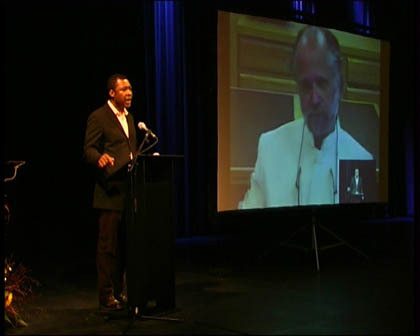 It is with this quote that Homi K Bhabha (professor of Language and English and American Literature and African Studies at Harvard University, Cambridge and Massachusetts) opens his speech for Platform1, theoretical backdrop and cultural opener for Documenta 11. 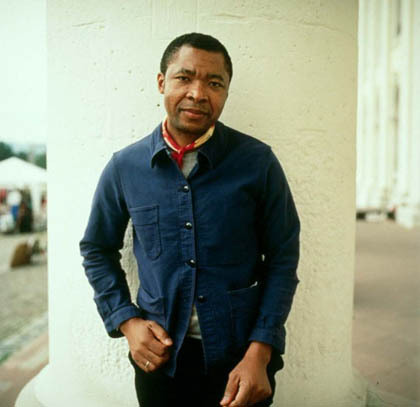 The eleventh edition of Documenta, one of the most important exhibitions of contemporary art around the world will take place from 8 June to 15 September 2002 in Kassel, Germany; the curator this year is Okwui Enwezor. Taking place every five years, Documenta was created symbolically in post war Germany since which time it has grown considerably. The last edition was in 1997, organised by Catherine David, who since January has been director of Witte de With in Rotterdam; it was noted not just for its multi-disciplinary approach but also for its strong interest in non Western territorial realities which are usually presented as “esoteric” artistic expressions rather than autonomous pieces, when not actually ignored. 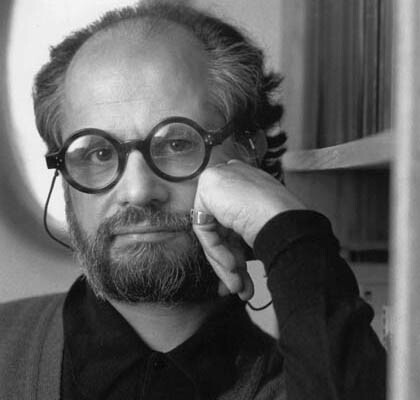 Around the same period for example, the Venice Biennale under Germano Celant with its demanding title “Future Present Past”, concentrated on a universe which was entirely western. Curator Okwui Enwezor, born in Nigeria in 1963 (working between New York, London, Chicago and Kassel) is famed for his successful organisation of the Johannesburg Biennale in 1997 along with his interest in the contemporary African art scene as well as in art which explores a social and political commitment in favour of racial minorities. In other words, an approach which is both multi cultural and decidedly interdisciplinary. To fill in time before June, draw the attention of the public and to render the tensions of contemporary culture more explicit, Enwezor has created a theoretical build up to the event. Four Platforms are planned – Documenta 11 will be Platform 5 – each with a central theme and a chosen city: Vienna, Berlin, New Delhi, St Lucia and Lagos. Each Platform is made up of conferences, symposia, debates, seminars, readings, book and film presentations, the acts of which will then be collected and published. Platform 1 is divided between Vienna and the House of World Cultures in Berlin with five days of conferences on the theme “Democracy Unrealised” Homi K. Bhabha, an Indian of mixed background is one of the speakers; he discusses the fragility of contemporary democracies, the victims of those never realised, the contradictions and possible revisions in the globalisation processes of the twenty first century, discussed and reconsidered after the terrible reawakening of the American September. He considers the urgent need for human and historical reflections on recent happenings, the apocalyptic images of death and destruction in New York, the rage and terror experienced by that which defines “a moral universe alien to our own” and the consciousness of the failure of democracy on its fundamental principles. Likewise an increase of nationalism and fundamentalism of every kind: dangerous errors which he feels are still perpetuated today with erroneous interpretations of the events taken place. He sees the interpretation of the facts as privileging an ethno-centric vision, across which an unhealthy fracture is being created between two civilisations; victims and executioners are transformed into worlds which are civilised and otherwise. CNN itself dealt with events by creating a polarisation between good and evil, using the faces of the two civilisations. To interpret a difficult political situation such as the clash between West and East, he maintains, is a damaging and dangerous strategy which ends up using the same politics as the terrorists: terror. Terrorism, even when pursued in the name of God or the state, is not an expression of cultural difference, but an organised political act, dangerous not just for America but also to the downtrodden populations who live in countries under totalitarian regimes. Homi K Bhabha closes the meeting expressing the hope of being able to stabilise a vision of global society which forgets the idea of us and them and is inspired by civil liberties and human rights and an awareness of duties and responsibilities. So, a platform of thought on contemporary issues in which gurus and other illustrious names from a range of fields: economists, writers, philosophers, literary figures, film experts, political scientists and Nobel prize winners, will be looking into themes such as “creolity and creolisation” or “experiments on truth”. Focussing the dynamics of cultural integration in the age of globalisation and helping Enwezor to create a kind of critical summary of current events, as well as making the resulting choices of the curator more understandable. Okwui Enwezor is not alone in these Pindaric flights, he shares his efforts with a team of co-curators: Carlos Basualdo, Susanne Ghez, Sarat Maharaj, Ute Meta Bauer, Octavio Zaya, Mark Nash, with whom he is currently travelling around Italy visiting artists studios and private galleries, a visit which is something akin to a lottery ticket. There is no need to underline how valuable an invitation to Kassel is, especially for the Italian art scene which has little exposure in terms of institutional appointments. However, it seems that before next June, or to be more precise June 6, it will not be possible to have the official list of the 100 selected. To satisfy our curiosity we can only look to the newspaper Kunstzeitung or other pseudo published lists in relevant magazines, which are not to be relied on according to the event press office. An atmosphere therefore of suspense in classic Documenta style: in the last edition the Federation of the association of European art galleries protested against Catherine David for having made the selections official too late, making the work of private galleries difficult. Documenta takes place every five years and in five years a lot can happen. Okwui Enwezor is sensitive to the concepts of identity, cultural transformations and migrations. This promises us an exhibition capable of a global vision, essential for the world to be considered as a whole. A quality that can guarantee not just a certain continuity, but also project towards the future. Good luck!